ST. PETERSBURG, Fla.— The U.S. Fish and Wildlife Service announced Endangered Species Act protection for the Florida bonneted bat today — the largest, rarest bat in the state. The Service delayed proposing lifesaving critical habitat for the species. Photo by Kathleen Smith, Florida Fish and Wildlife Conservation Commission. This photo is available for media use. 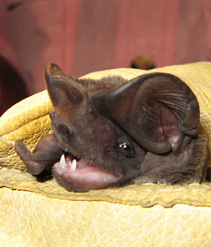 Open fresh water and wetlands provide prime foraging habitat for Florida bonneted bats, while trees and human-made structures are used for roosting. But the bats’ habitat is projected to experience sea-level rise of as much as 3 to 6 feet within this century, meaning that nine of the 11 roost site locations will be either fully or partially inundated. With even one foot of sea-level rise, four roost sites would be largely or completed inundated. The decision is a result of a historic settlement agreement signed with the Center for Biological Diversity that requires expedited decisions on protection for 757 plants and animals around the country.